Steven (Chicagoland, United States) on 16 October 2009 in Cityscape & Urban and Portfolio. 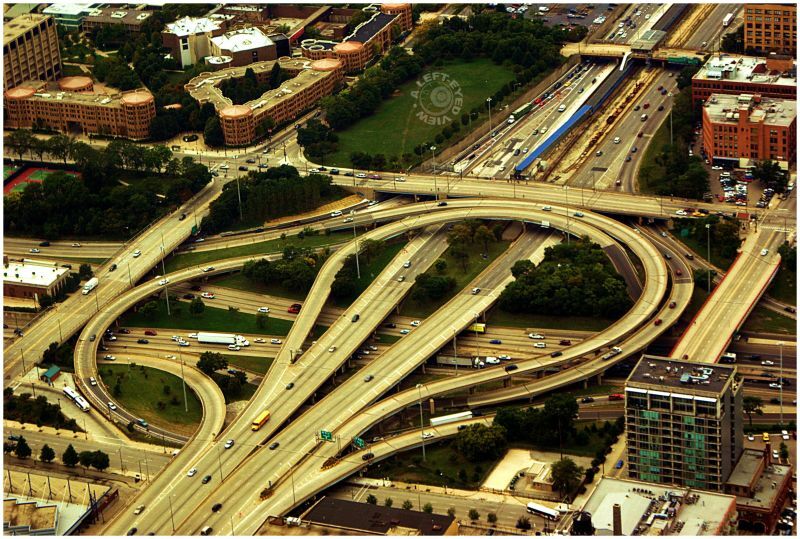 The Circle Interchange, also called the Spaghetti Bowl, is an expressway interchange near downtown Chicago, Illinois. It is the junction between the Dan Ryan, Eisenhower and Kennedy expressways (Interstates 90/94 and 290). The name refers to the curving ramps that appear to form concentric rings when viewed from above, and is commonly used by local radio traffic reporters. The interchange is notorious for its traffic jams. It is rated the country's third-worst traffic bottleneck, with the drivers of the approximately 300,000 vehicles a day using it losing a combined 25 million hours while stuck in it. The University of Illinois at Chicago can be seen in the top left of the photo, southwest of The Circle. This view is from the Skydeck of the Sears Tower, looking southwest. Photo taken September 25, 2009.
what a view... fantastic shot. Amazing color and light...what a beautiful view!! that sky deck offers some pretty amazing views! excellent aeriel!! excellent aerial shot...I can only imagine the mess at rush-hour! Great shot! The framing is terrific, and the interchange truly is an interesting design. Rush hour must be a lot of fun in this place. Great POV for this shot. Whoa, what a monster! I would be lost there! :-D Super capture! Wow! That is quite the interchange. Makes me dizzy just looking at it. Reminds me of some of the horrendous stuff in Dallas and Houston. It's really impressive Steven from this angle ! We look so tiny ! That is very cool. Very strong composition. Makes a twisted kinda sense when you study what it does but it would take so little to clog it all up I can see. Great shot from the 'Tower.